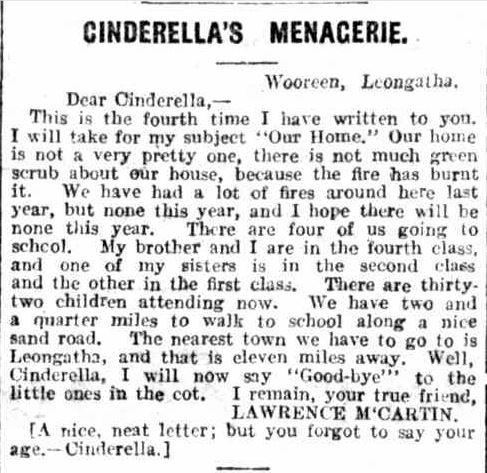 Back in the 1910s, the Leader newspaper, a weekly town and country paper published by The Age, ran a column for children called “Dear Cinderella”. The letters, mostly written by country children, tell much about life during those times as seen through the eyes of a child. I have selected a few of the letters to share this Trove Tuesday, with a couple from the Western District. While many children wrote letters to Cinderella, only a handful were published each week. Therefore the children often mentioned the number of times they had previously written, hoping Cinderella would finally pick them. Most times she gave a short reply as she did with Lawrence McCartin of Leongatha. Lawrence had told of the burnt bush around his home and about school life. Cinderella then ticked him off for not giving his age. Val Ringberg of Omeo also wrote of fires and some new phonograph records. 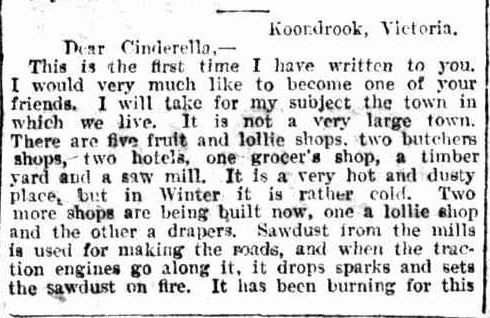 In the following group of letters, Edith O’Neil gave a great description of the shops in Koondrook in 1914, including five fruit and lollie shops with another lollie shop under construction. You can never have enough lollie shops. 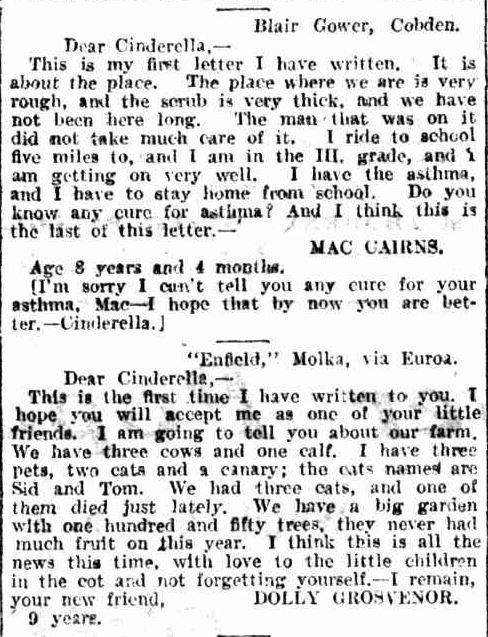 The following letter from Nickolas (sic) Dix, takes us right into the countryside that Major Thomas Mitchell called Australia Felix. 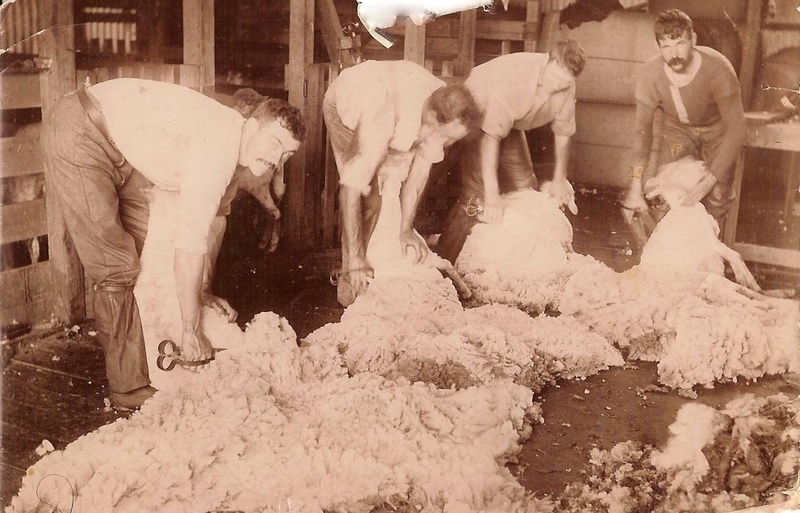 Nicholas lived at Davos Farm at Wurt Wurt Koort near Merino. 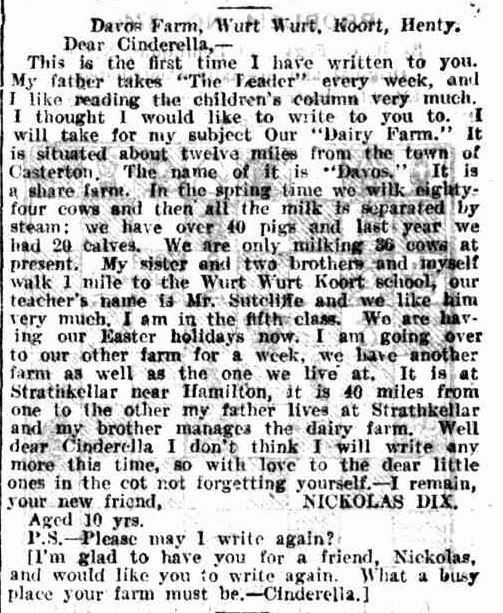 Nicholas wrote about the Wurt Wurt Koort School he attended and his father’s other farm at Strathkellar, near Hamilton. Because Nicholas’ family lived in the area largely focused on by Daryl Povey’s site Glenelg & Wannon Settlers and Settlement, I thought it worth a search for the Dix family and I found them. Nicholas was the son of James Nicholas Dix and Margaret Theresa Doyle and was born in Casterton in 1903, one of fourteen children. Something interesting I found was that Nicholas’ younger brother was Anthony Strathkellar Dix, named after the location of the other Dix farm. Even more interesting was that when young Nicholas grew up, he joined the Royal Australian Navy in 1918 and by WW2 he was a Chief Petty Officer and recipient of a Distinguished Service Medal (DSM). Thank you, Daryl, for the extra information about Nicholas. 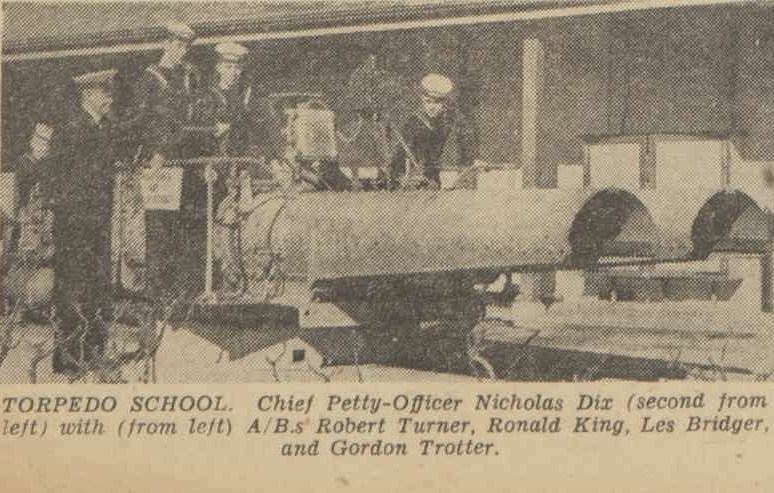 Back to Trove, and I found a photo of Nicholas Dix. It’s not a clear photo of him, but we can see the little boy from the Western District who wrote to Cinderella in 1914, thirty years later as a forty-one-year-old Naval Officer. 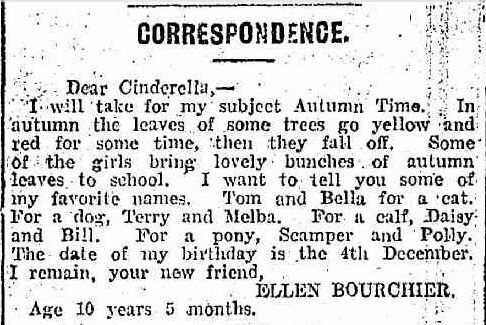 Back to the “Dear Cinderella” letters and I love this one from Ellen Bourchier. She writes about her favourite names for dogs, cats, calves and ponies. 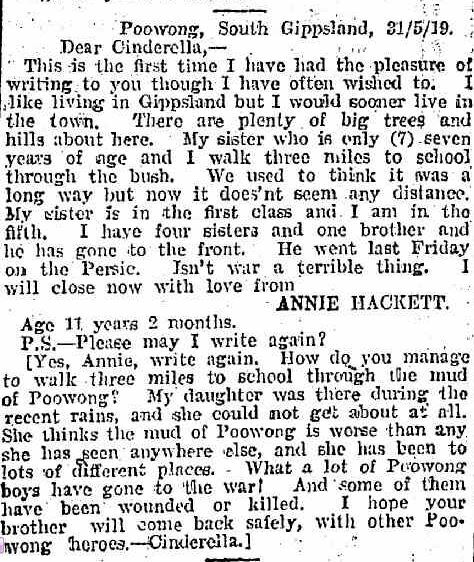 Cinderella wrote a longer reply than most, for Annie Hackett of Poowong. She wondered how the children managed the three-mile walk to school after rain, such as that experienced by Cinderella’s daughter during a visit to Poowong. (first I knew Cinderella had a daughter). 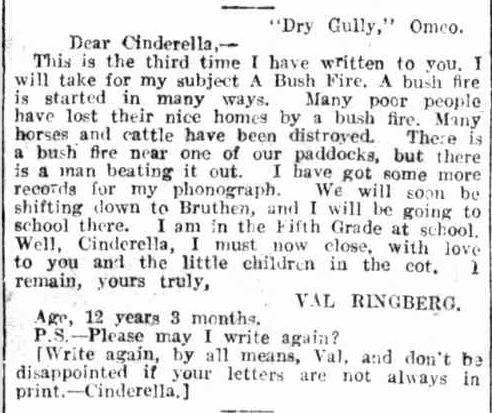 These charming letters are well worth reading with most found with a search at Trove of “Dear Cinderella”. If you include a town name, you can narrow the search down. This entry was posted in Trove Tuesday and tagged Dix. Wurt Wurt Koort. Bookmark the permalink. Thrilled to find this letter our dear Pop wrote! Thank you so much. Nick’s family is delighted!